Kids learn the parts of a book early on. One of the first parts they learn is the front cover and all the things that go on it. Here kids get to make their own front cover. 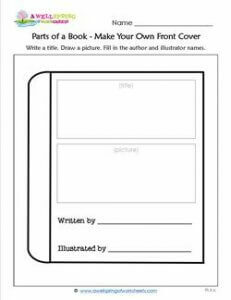 With spaces already outlined for them, kids get to come up with a title, make an illustration, and add an author’s and illustrator’s name.